WITH ITS DISTINCTIVE LOOKS, ROCK SOLID BUILD QUALITY AND RELIABILITY PLUS OUTSTANDING PRACTICALITY THANKS TO ITS SPACIOUS BEST-IN-CLASS BOOT AND INGENIOUS FOLDING SEATS THE HONDA CIVIC HAS A LOT TO SHOUT ABOUT. UNDER THE BONNET LIES THE SUPERB 1.6 i-DTEC ENGINE WHICH, THANKS TO ITS STOP/START TECHNOLOGY, ACHIEVES AN UNBELIEVABLE 85.6 MPG AND IS ZERO ROAD TAX MAKING IT CHEEP AND VERY ECONOMICAL TO RUN. 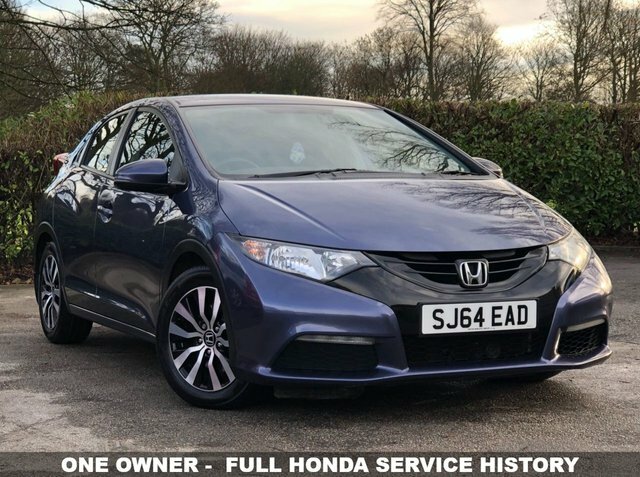 THIS 1 OWNER VEHICLE WE HAVE IS IN STUNNING CONDITION INSIDE AND OUT AND HAS BEEN WELL MAINTAINED WITH FULL HONDA MAIN DEALER SERVICE HISTORY CONSISTING OF 6 SERVICE STAMPS THE LAST DONE AT 75382 MILES ON THE 21/05/2018. GENEROUSLY EQUIPPED IT HAS FEATURES INCLUDING BLUETOOTH TELEPHONE, CLIMATE CONTROL, RADIO/CD WITH AUX AND USB TO NAME A FEW. THIS CAR WILL COME WITH A FULL MOT + SERVICE + WARRANTY + 1 YEAR AA ROADSIDE ASSIST ALL INCLUDED IN THE SCREEN PRICE.